Vote: Is Christmas football a good thing? Right then, that's quite enough from us for tonight. But you can join Marc Higginson tomorrow from 09:00 GMT for build-up to all of Saturday's fixtures. Until then, thanks very much and see you soon. "Van Gaal is the scariest man"
Manchester United manager Louis van Gaal was angered on Friday when journalists asked him if he will sign former Barcelona goalkeeper Victor Valdes, who has been training with the club. Former Blackburn Rovers striker Benni McCarthy tells BBC Radio 5 live: "He signed me when I was a youngster and I've never walked on egg shells in my life like I did then. Now he is a changed man but then, on the football pitch, he was the scariest man. He is a perfectionist and he does not want mistakes, even in training. "I'd be training with the first team and being sick because I was petrified." Is Danny Welbeck fitting in at Arsenal? Former Blackburn Rovers striker Jason Roberts, speaking on BBC Radio 5 live: "There is no doubt that when you're a young player coming through you are looked at differently to when a club pays a lot of money for you. "I think that even now Danny Welbeck could be in the Manchester United side but they always looked at him as the player who had come through. I think the move has been excellent for him as a man. Even though Olivier Giroud is coming back, he has gone there and puffed out his chest." "You want me to run? I'm not Paul Dickov." career at the club is over. "I'm disappointed more than anything," Bruce told BBC Radio Humberside. "We brought him in on a wave of publicity and there has been no fall-out or slanging match. His views of the game are different to mine." Former Blackburn Rovers striker Benni McCarthy tells BBC Radio 5 live: "The work you have to put in to the English game, you don't realise when you come from abroad. You think watching you will be able to skin this player or that, but it doesn't happen. "When I came to Blackburn and was told about 'running in the channels', I'd never heard this expression. I couldn't understand. Do you want me to run or score goals? 'I'm not Paul Dickov', I once told Mark Hughes.'" Ben Arfa played just eight times for Hull but Newcastle boss Alan Pardew says he will not return to the Magpies - his parent club. "Too many games at Christmas"
BBC Radio 5 live's programme with Jason Roberts and Benni McCarthy is coming to an end now, but here are a few of the highlights. Former Blackburn Rovers striker Benni McCarthy on his experience of the hectic festive programme in England: "From coming from the continent to here it was completely different. You really feel a change in atmosphere, a festive one at the ground and I think people don't give you as much stick as they do normally. "People are more cheerful at football games. I used to think it was too many games in a short space of time." Struggling Tranmere were looking good for victory when Cole Stockton put them 1-0 up against Cambridge, who then had Robbie Simpson sent off. But Michael Nelson headed the U's level from close range late on to rescue a point. Burton, who could have gone top with victory, drew 0-0 at Southend. With that win, Bolton move up to 14th overnight, while Millwall remain in 20th. They could slide down a place if Rotherham win away to Wigan on Saturday. But what a transformation Bolton have enjoyed under Neil Lennon. They're now unbeaten in seven and haven't conceded in four. When Lennon joined in October, the Trotters had won one in their last 11. That's it. The final whistle goes and that's a valuable three points away from home for Neil Lennon's side. A fourth straight clean sheet for Bolton. They defended very well to keep Millwall at bay in the latter stages. Bolton break down the Millwall left through Tim Ream but his Conor Wilkinson-bound cross is intercepted by Nadjim Abdou. One more throw of the dice from the home side? Substitute Conor Wilkinson almost seals it for Bolton but David Forde turns his angled drive away. Strong hands there from the goalkeeper. There are five minutes of time added on. Andy Lonergan makes a great save to deny Martyn Woolford the equalising goal. Surely there's one more good chance left? Conor Wilkinson comes on for Rob Hall as Bolton look to get over the line. There's just five minutes left for Millwall. "If I don't score, I don't go out." Over on BBC Radio 5 live, former Blackburn Rovers striker Jason Roberts and Benni McCarthy have been previewing the weekend's football action. Discussing Sunderland striker Jozy Altidore, who has not scored a league goal for the club yet this season and goes into Sunday's derby with Newcastle off the back of a glaring miss in last weekend's draw with West Ham. Former Blackburn Rovers striker Jason Roberts tells BBC Radio 5 live: "You're passionate about what you do. It's not a case of going home and forgetting, this is an issue and it's your passion. "My way of dealing with it would be not to leave the house. The majority of players I've been with, it means that much to them." Bolton's Matt Mills goes into the book for a challenge on Martyn Woolford. Bolton are looking comfortable at the minute, and Millwall have only got eight minutes or so to find a goal. So Bayern extend their lead at the top of the Bundesliga to 14 points and they are off for a happy Christmas break. Wolfsburg can narrow the gap back down to 11 if they beat Cologne on Saturday. Mainz, meanwhile, stay in 11th, but could find themselves further down the table come Sunday evening. They're only three points clear of the relegation zone and Borussia Dortmund (yes that Dortmund) in 16th. Millwall make their final change as they go forward in search of an equaliser. Andy Wilkinson comes off, Jimmy Abdou comes on. The referee blows up and Bayern record yet another victory. They did concede tonight though. After that Bayern goal, the prize for happiest man in the ground has to go to Manuel Neuer. He wheeled away in celebration straight towards the Bayern bench as Arjen Robben turned in. Neuer was at fault for the Mainz goal, and boy does he not like drawing. That should be that now. Mainz give the ball away in midfield and Franck Ribery surges forward, finding Juan Bernat on the left. His cross squirts past Thomas Muller as he tries to turn it in but Arjen Robben is on hand to finish. It's harsh on Mainz - they've put Bayern under real pressure at times. Bayern are still patiently probing but there's little sign of a late winner in Mainz. Thomas Muller is penalised for a foul on a Mainz defender, and the home side slow the pace down. Three minutes to go plus stoppage time. The deadlock is broken at The Den as Darren Pratley races onto a through ball to finish past David Forde. Rob Hall had hit the post just moments before. It's Bayern who look the more likely to score though. Their possession may have dropped from 74% in the first half to a mere 69% now, but Mainz are tiring after having had to chase the ball all night. There are 10 minutes to go for Mainz to sign off their first half of the season win style with a win against champions Bayern. The hosts make another change, with Patrick Pflucke replacing Pablo De Blasis, who had a goal ruled out for offside in the first half. For Millwall, Scott McDonald is replaced by Ricardo Fuller and Lee Martin replaces Magaye Gueye. Bolton replace Eidur Gudjohnsen with Liam Trotter. The former Barcelona and Chelsea man played 61 minutes. Bayern replace Mario Gotze with the evergreen Claudio Pizarro. Mainz also shuffle their pack and it's Junior Diaz on for Ja-Cheol Koo. The vote: Do we need a winter break? Voting is now closed and the results are in. 74% of you want to keep the status quo, while 26% favour a mid-season break. Arjen Robben wins a free-kick in the exact same position Mario Gotze was fouled minutes ago. Bastian Schweinsteiger and Robben debate the merits of each one taking it before Robben strikes an outswinging cross and Loris Karius clears with a confident punch. The ball comes out to Pierre Hojbjerg on the edge of the box who strikes a low shot but it's deflected wide for a corner. Mainz have only lost at home once this season, but they were on thin ice there. Almost a moment of real calamity for Manuel Neuer - that really would have been a rarity. The Germany international spills the ball when he should have collected cleanly but Mainz are penalised for a foul and Neuer breathes a sigh of relief. He's away for Christmas already. The home side's appeals for a penalty are turned down after Lee Gregory collides with Bolton goalkeeper Andy Lonergan. Down the other end Darren Pratley goes close again for the away team, shooting just wide from the corner of the box. Where else would Ricardo Quaresma, Tranmere and Cefn Druids appear together? Check out our Videprinter for all the goals tonight from Britain and Europe. 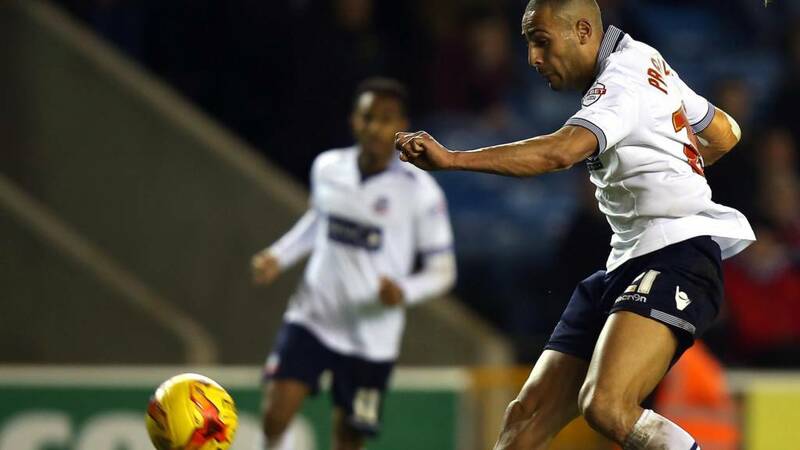 An early sight of goal for Bolton as Darren Pratley heads over the bar from Liam Feeney's cross. Josh Tetley Thomas: If underpaid nurses etc have to work over Christmas then surely these players should be made to play without a winter break. Jono Walker: Everyone should be able to see their family over Xmas ... even overpaid footballers/managers so yes we can wait. Ed Ruane: It's tradition. Leave it as it is please. Back under way at The Den. No changes for either side. Franck Ribery strikes the free-kick but it's straight into the wall. A let off for Mainz. A nervous moment for the home side as the referee blows his whistle for a foul by Thomas Muller in the Mainz box. Muller was struggling to get his shot away, surrounded by defenders, and I'm pretty sure a few of the Mainz players thought the ref had blown up for a penalty rather than a free-kick. He must have thought Muller dived, but there was no yellow. David Claxton: No need for a winter break, just plan in the odd snow day and do away with pointless friendly internationals, get kids to matches. Vincenzo Re: Yes to Christmas games as convenient for supporters, who should always be considered first before needs of players. Yunus Malli then breaks down the field and forces a wonderful save from Manuel Neuer with a strong right-footed shot. Neuer was at fault for the goal, but that was a very strong palm away to save his team from going behind. Elkin Soto sees yellow for a nasty foul on Mario Gotze. The youngster hasn't done much so far tonight. An even game so far The Den. Will one of these teams risk more going for a winner in the second half? We're back under way in Germany. Mainz give away possession immediately as Pablo De Blasis fouls Dante. Millwall almost sneak the lead just before the break as Angel Martinez shoots just wide on the half-volley. Two minutes of time added on. Bolton have had a shout for a penalty when Rob Hall was upended in the box but the referee was having none of it. Darren Pratley then has a sight on goal but scuffs his shot. Just a few minutes to go now before half-time. "Liverpool should have changed for Carroll"
Former Blackburn striker Benni McCarthy speaking on BBC Radio 5 live: "Liverpool have got into a pattern of buying people and then not adapting their style to fit. You saw it when they bought Andy Carroll. He was tearing up trees with Newcastle and their more direct style, but Liverpool wanted him to play a different system and the goals dried up. "If you are willing to spend that amount of money on a player then you have to accommodate him." Alan, Coventry: What would happen if say the winter break was four weeks covering the end of December into January and then all the bad weather was in February? No goals after half an hour in tonight's two League Two matches. Southend and Burton are level, as are Tranmere and Cambridge. Burton would go top overnight if they win. Millwall have settled at The Den and Lee Gregory has had their best opening. He collects a long ball but fires inches wide of the Bolton post. Bolton have three clean sheets in a row but that admirable run almost ended there. It's Mainz who finish the first half stronger as Pablo De Blasis heads down for Shinji Okazaki in the box, but the Japanese waits too long and the ball is nicked away by the Bayern defence. Plenty of reasons for Mainz coach Kasper Hjulmand to be cheerful. Sterling, Lambert or Balotelli up top for Liverpool? Former Blackburn striker Jason Roberts, speaking on BBC Radio 5 live: "Raheem Sterling is not yet a striker, and you could see some of that with the chances he missed against Manchester United, but he looks like he is warming to the role with Liverpool. "I think that the bigger problem is how Liverpool are playing. They don't have the same pace up front, the same urgency from the first whistle. "Mario Balotelli and Rickie Lambert are more targetmen, than players who will run in behind. "You have to look at the buys that Liverpool have made and they don't fit their style." Yet another cross from Daniel Brosinski flashes across the Bayern penalty area. Bayern have had all the possession in this half, but they've done very little with it. Mainz on the other hand, have been industrious and ambitious. They're taking Bayern on. In about five minutes time Yunus Malli is going to realise just how golden a chance he has just missed. One-on-one with Manuel Neuer as a chipped ball arrives in the box, the winger tries to lift the ball home but his effort is tame and Neuer gathers. Five to go until the break. Former Blackburn striker Benni McCarthy, speaking on BBC Radio 5 live: "It certainly looks like Raheem Sterling is Liverpool's first-choice striker. His two goals against Bournemouth in the League Cup is more than the other strikers have showed so he deserves to stay in that role. "Mario Balotelli is talented but his head is not in the right place. Rickie Lambert has played OK, and got a few goals but he has not got enough to dig Liverpool out of the hole they are in." Over on BBC Radio 5 live, former Blackburn strikers Benni McCarthy and Jason Roberts are previewing the weekend's football action. You can listen using the Live Coverage tab at the top of this page. After seeing two goals in such quick succession we've reached something of a ceasefire. Bayern have been very patient with their 71% possession, but Mainz continue to show promise when they do get hold of it. So far the greatest danger has come through Franck Ribery, on the Bayern left, and Arjen Robben, on the right. Garath: The Premier League should do it like the Irish Premiership. They always have local derbies on Boxing Day. The Premier League is all about money. Steve Howes: A winter break means break but the players would still be on Uefa-sanctioned friendly trips on the other side of the world. It's the away side who are enjoying the better of the opening stages at The Den. Bolton defender Tim Ream has already come close with a glancing header which was well saved by David Forde. Mainz's lead lasted just over three minutes. Bastian Schweinsteiger curls in a fabulous free-kick for his first goal since April, the ball clipping the post in the top left corner on its way in. Loris Karius travelled a long way to try and stop it, but was well beaten. Great technique from the Germany international. This time it does count! A searching cross from the Mainz right finds its way to the left side of Manuel Neuer's goal before anyone makes contact and Elkin Soto stabs the ball home from a tightish angle. Neuer does not concede many, and that one is soft by his standards. Matthew Turner: Excited about Eider Gudjohnsen's return to Bolton. He was a great servant to that club and also every other one he played for. The flag is up again and this time Arjen Robben is denied what would have been a goal. He rounds the Mainz goalkeeper running in from the angle but the referee had blown. Bayern have had 73% possession over the first 15 minutes of the game. Although Mainz have had a goal ruled out for offside too. James: I reckon the Premier League should scrap the Boxing Day fixtures, as it would allow players to spend more time with their families around Christmas. And Bolton get us under way at the New Den. Dante goes in with a real crunching challenge on Daniel Brosinski. He escapes with a caution, but you feel Brosinki's pace could cause Bayern a few problems tonight. He and Yunus Malli down the Mainz left have had a bit of joy already. A reminder of the threat Bayern pose as Arjen Robben nods down for Thomas Muller in the box. The Germany international has his shot blocked by Gonzalo Jara though - the former West Brom and Nottingham Forest defender. Plenty of possession so far for Mainz. They're keeping the ball nicely. Jerome Boateng blocks an ambitious through ball that would have played top scorer Shinji Okazaki through on goal. Carl Dale: For £300,000 a week I would play every day. Even players on £10,000 have no right to complain against fixture list pile-up. Are they on too much money? Absolutely! But if someone asked you to sign a contract for £300,000 a week to play maybe one and a half to three hours a week, would you sign it? I know I would. Matej Dastich: Winter break is pointless. Just leave it like it is. What the hell would I do that long without the Premier League? Jimmy McClymont: It's a joke, supporters having to travel all around the country! Why not make it local fixtures and give the game back to the people who matter - the supporters!! Mainz are coming forward with plenty of ambition here, the home side look really up for this. What a way it would be to sign off before the winter break - a win over the champions anyone? That would have been just the fourth time Manuel Neuer has been beaten in the league this season. Mainz think they've taken the lead but the joy is only momentary - the assistant referee has has his flag up and Pablo De Blasis was offside as he nodded in a cross from the right. Bayern counter and Franck Ribery has a shot blocked. An uncharacteristically untidy long ball from Bayern gives possession back to Mainz straight away, but normal service is quickly resumed. Those triangle passes are already coming out and Franck Ribery dribbles into the box for the first shot at goal. It's weak and wide though. We're under way at the Coface Arena. There's a huge cloud of smoke drifting across the pitch as Bayern kick-off. "France has the world's best young players"
One story you may have missed today comes from France, where Marseille manager Marcelo Bielsa has been holding court before his side's meeting with Lille on Sunday. "I believe French football has the best young players in the world," said the Argentine. "The best clubs in the world will buy 15 players from this league who are under the age of 25, maybe more." #bbcfootball on Twitter, or text us on 81111 (UK only). Dutch Sportsman of the Year, becoming the first footballer to claim the prize since Ruud Gullit in 1987. Now, if it was a case of keeping just the one ludicrously gifted forward quiet then that might be all right, but once you've added Mario Gotze, Franck Ribery and Thomas Muller into the equation then, well, good luck. No Robert Lewandowski tonight at least. John McEnerney: Bayern are going in to the break in fine fettle. And they'll benefit big time resting their World Cup winners ready for the run in to the Champions League final. Andrew Priestley: It's a NO to a winter break in British football. The jam-packed festive fixture list is what makes our football calendar great. The line-ups for the teams at the Coface Arena are also in. There's no Xabi Alonso or Robert Lewandowski for Bayern - they're both out injured. The super-quick Junior Diaz drops to the bench for Mainz. Mainz: Karius, Jara, Wollscheid, Geis, Malli, Koo, De Blasis, Brosinski, Soto, Okazaki, Park. Bayern Munich: Neuer, Dante, Rafinha, Boateng, Bernat, Schweinsteiger, Hojbjerg, Ribery, Robben, Gotze, Muller. I think we'd be safe in saying that if any team can catch Bayern, it won't be Mainz. They've won just three games this season - only Freiburg have won fewer - and are 11th-placed in the table. How can you describe Bayern Munich? Because dominant doesn't really do it justice. The Bavarians are unbeaten in the Bundesliga, 11 points clear of Wolfsburg and have conceded just three league goals all season as they chase a third consecutive title. We already know that Pep Guardiola's men will go into the winter break as mid-season leaders - the official title is 'Herbstmeister' - but are they unstoppable? Manchester City have already had a hand in helping us out with that one in the Champions League, but on the domestic front, can anybody catch them? The line-ups are in and Eidur Gudjohnsen makes his first start for Bolton since rejoining the club he left for Chelsea in 2000. For Millwall, defender Alan Dunne replaces Mark Beevers in the only change from the side that beat Brighton 1-0 away last Friday. Bolton: Lonergan, Vela, Mills, Dervite, Ream, Danns, Pratley, Feeney, Hall, Lee, Gudjohnsen. Millwall: Forde; Wilkinson, Shittu, Dunne, Malone; Angel, Williams; Gueye, McDonald, Woolford; Gregory. Bolton manager Neil Lennon will be hoping one man in particular can turn the club's fortunes around. his return coincides with growing signs of optimism as Bolton begin to forget their terrible start to the season. Lennon was appointed manager in October but are now unbeaten in six. They're still 18th in the table though, and with forwards Max Clayton and Joe Mason both out injured, will former Barcelona and Chelsea striker Gudjohnsen still be able to contribute, at age 36? There's probably not many of you out there who don't like a Friday, but this time last week Millwall fans had extra reason to be in good spirits. 5-1 thrashing at home to Middlesbrough. Can Ian Holloway's men, 20th in the Championship, pick up another valuable three points at home to fellow strugglers Bolton tonight? Vote: Do you want a winter break? Tuesday's 2-0 home win over Freiburg. The Bavarian club treated their fans to a Christmas-themed laser show as they wrapped up the first half of the season on home soil. This round of Bundesliga fixtures is the last until January. Would the Premier League benefit from splitting the season into two halves? What about national teams? And more importantly, what else would you do on Boxing Day? You can vote on this page. Also, feel free to let us know your thoughts in greater detail over the usual channels. Good evening and welcome to what is officially the last Friday night before the big day. Whether you're knee deep in festive cheer and sticky tape or are planning an escape already, we've got plenty to keep you entertained tonight. Mainz and Bayern Munich meet in the Bundesliga at 19:30 GMT, Millwall host Bolton in the Championship at 19:45, plus there's Southend v Burton and Tranmere v Cambridge in League Two. over on BBC Radio 5 live this evening, winter breaks.